Hey guys! I’m checking in tonight with a recipe for creamy vegan mashed cauliflower–a perfect, easy, and healthful vegan side dish. Before I tell you how delicious and easy to make the recipe is, I should disclaim that I have some inherent discomfort with coming up with what seems like a substitute for mashed potatoes. 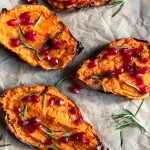 I love potatoes (baked, mashed, or boiled), and I don’t have any desire to replace them (or all of the energy-providing complex carbs that come with them). But oftentimes, a dish like mashed cauliflower can remind us that there’s more than one way to serve a favorite veggie. We take a cue from another popular vegetable side dish (like mashed potatoes), and it encourages us to try something new. As it turns out, mashed cauliflower is super delicious, and while it’s not the same (not even very similar, really) to mashed potatoes, it is rewarding in its own right. So, here’s the recipe. I hope you’ll enjoy it! 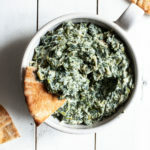 My boyfriend and I have been eating a lot of it as a side dish lately, and we’re finding that it can be paired nicely with almost anything. Bring a large pot of salted water to a boil. Boil the cauliflower till tender (about 7-10 minutes). Drain the cauliflower and place it into the bowl of a food processor fitted with the S blade. Pulse it a few times to break it down, then add all of the remaining ingredients except for the chives. Process the cauliflower till it's smooth, but the mash retains a little bit of body and texture. If you need to make it thinner or easier to blend, continue to add non-dairy milk as needed. Fold the chives into the cauliflower. Serve. 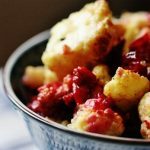 The mash is not only perfect for weeknight suppers (thanks to the speedy cooking time), but it’s also a great option for holiday gatherings and get-togethers. It’s definitely a crowd pleasing dish. Before I go, I wanted to share the tremendously exciting news that I’m one of seven women featured in Kathy’s incredible Veggie Girl Power Series! Each year, Kathy interviews seven notable vegan or vegetarian women about their lives, their work, and their roads to plant-based lifestyles. I was a rapt reader of last year’s series, which included interviews with some of my culinary idols, including Sarma Melngailis, Chloe Jo Berman, and my girl Kristen of Kristen’s Raw. So it came as a shock—albeit it a welcome one!—that Kathy wanted me to be one of this year’s Veggie Power Girls. 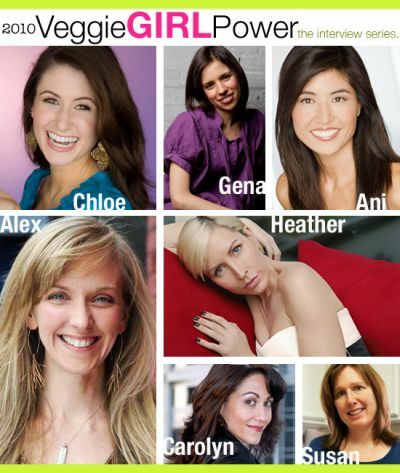 To be in the company of Susan from Fat Free Vegan, Chef Chloe Coscarelli, and my friend Ani Phyo is such an honor! In the interview, Kathy describes me as “anything but ‘quiet'” and as someone who “who speaks her mind without hesitation.” I think this is Kathy’s way of saying that I’m loud and opinionated. And I love it. What’s the first thing you eat each day? Who are some of the people who have inspired you? How do you respond to attacks or negative criticism? To read my answers, please check out the interview here, and don’t forget to check back for the other interviews in the series! nom. vegan mashed cauliflower made it’s way onto my thanksgiving table. i used almond milk, EVOO, roasted garlic and parsley in mine.2 large heads were consumed by the 6 of us! cute article! OK sorry if this is off-topic, but I just read your lovely Veggie Girl Power interview (congrats!) and I thought of a vegan-but-not-food-related question. Would love your recommendation on stylish vegan purses/bags. I’d like to ditch the leather habit, and have no idea where to start and I like your style. I am so glad that carbs and I are BFF these days. Life is too short to live without delicious carbs! I’m so excited for you! I can’t wait to check it out! I too have wondered what it would be like to eat mashed cooked cauliflower after having the raw version. Interesting to hear your take on it. I think I’d rather just go for the real potatoes since I eat it so infrequently. Lovely interview! And great to know about the series. I appreciate your respect for Ingrid Newkirk but I don’t know if you realize just how many companion animals PETA is responsible for killing. It’s not necessary and it makes them very hated among companion-animal loving circles. They’re also pro breed bans, which pisses off lots of people as well. Not to mention their welfarist approach versus taking a stance on the abolition of animal use altogether. I can’t stand that people think of PETA first when they think of animal issues. Don’t get me wrong, they’ve done some good, but they have also done harm. Really glad you shared, and I’m going to research this more. I understand your fury that PETA and animal rights are synonymous, given these facts. From my point of view, as someone who “discovered” AR (or rather, cultivated enough humanity to understand them) late in the vegan game, I found PETA to be really galvanizing and inspiring. The sheer level of effort and energy impressed me deeply at a moment when I needed a push. I took a lot away from them as someone who was thirsty for information, for inspiration, and for a reminder not to compromise. I see Ingrid as the face of PETA, hence the admiration from afar. But that doesn’t mean I’ve really studied the organization from top to bottom, and it’s really easy to miss this kind of fact. So, as ever, I appreciate YOU for not compromising, and for sharing what you know. Their rationale is that it’s compassionate since most animals will never be adopted – and that many of the animals they put down are incredibly sick and diseased. Obviously there’s no easy answer here (I dont think) but they are open about their policy, if you wanted to learn more about it. Thanks for chiming in, Lindsay, this is helpful. You posted this just in time! I have been dying to make that recipe of Susan’s for about a year now (I’m a little behind) but actually bought the green beans to make it earlier this week after being reinspired by Thanksgiving. I was debating just leaving off the fried onions because I didn’t really want to use them but your solution of using caramelized onions is fantastic!! How cool!! I can’t wait to check out your interview, and the others as well! I always listen to Carolyn’s Healthy Voyager podcasts as I walk our dogs! But first, the cauli mash looks great. I have never really gotten into making mashed cauli as a substitute for mashed potatoes. When Skylar was a baby, I’d steam cauli and just mash it with a fork, that’s as close to a cauli mash as I’ve gotten 🙂 Your version looks great…and thanks for the relink to those marinated ‘shrooms! I NEED to make those. Yum! What a lovely post of casseroles, mashes, and good things in your life…job well done, Miss Gena! i had raw cauli mash for the first time in ages just a few days ago….! as delicious as i remembered it last. i should give this cooked one a try. i don’t think i’ve ever had cooked cauli! Congrats, that’s awesome about Veggie Girl Power! I will be a reader this year! 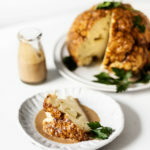 And the cauliflower recipe looks wonderful, perfect to try over the holidays. Thanks! You’ve heard me on the phone. You know. I love mashed cauliflower, not for its similarity to mashed potatoes but rather for its own flavor and texture. I have plans to experiment with a purple cauliflower this week! Great interview! What are some of your favorite uses for the Vega Vanilla Chai? I’ve only tried the chocolate and the berry. The mashed cauliflower is a great idea too. I like it in any smoothie! I’ll also use it in chia seed puddings. Congratulations on the awesome interview! I’ve made mashed cauliflower before, but never your raw version…. I have some cauliflower in my fridge now and I’m tempted to do it but a bit reluctant due to the fact that the last raw cauliflower soup I made was a bit of a flop. You make it sound so delicious, I think I may finally give the raw version a try! I just read your interview-it was an enjoyable read! One thing that particularly struck and inspired me was when you mentioned your outspoken attitude about your veganism. As someone who tends to worry about the impression I make on omnis;worrying about sounding strange, hearing about your approach is motivates me to do the same. Hurrah for unapologetic veganism! Congrats on the interview – look at you there, right next to Ani and looking just right! I’ll have to go read it, haven’t yet. Inspiring post in general, for sure. I love mashed cauliflower, both raw and cooked, but just now I’m just starting to make nice with carbs and think it’s a good thing too. I grew some lovely cauliflowers up here this year: had to just eat them raw, they were so good. But I have done cooked mashed cauliflower with just leeks, a bit of thyme and a bit of nut milk – so good! Mmm yum, cauliflower is one of my fave veggies! I make a very similar version to this but use a little macadamia nut oil at the end and it is DIVINE. Congrats on being featured in the interviews! I am heading over to read it shortly. But first I just had to say that I love mashed cauliflower! I was hesitant to make it for a long time because I was convinced it wouldn’t taste good, but I am so happy I went on a limb that one day and tried it. It’s so comforting without being heavy. I made mashed cauliflower just the other day! I’m not a potato-kinda gal so the cauliflower replacement is perfect! What is earth balance? I haven’t heard of it, is it American? This look so creamy and lovely. I’m not raw or vegan but you inspire me to stuff myself with more fruits and veg and possibly, someday, consider a vegan lifestyle. Congrats on your success! 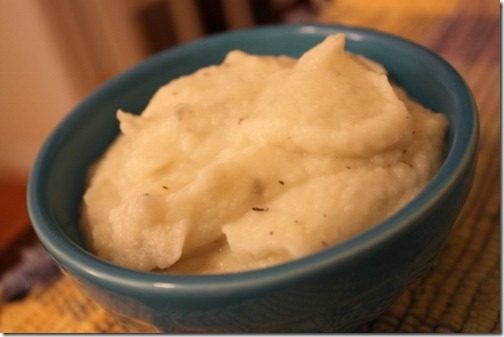 I love cauliflower mash! I usually use a hand-masher because I like a little bumpy texture in mine. Delicious. Your plated meal looks lovely. I’m such a big fan of mushrooms. I think this meal would be a perfect example to a skeptic that vegan food choices are versatile and can be hearty. Someone recently asked me if vegans only ate vegetables and I realized that there must be so many unknowing people out there. I love that your blog spreads the word. oh gena, what would i ever do without your loud opinionated self. i truly adore each and every post more than the last. you definitely deserve to be in the veggie power girl series. cant wait to check it out! Oh Elise, what would I do without your loud opinionated comments, or without your friendship, or without all of the incredible and thoughtful commentary you always give me? You are truly the best. I still need to make marinated mushrooms!! 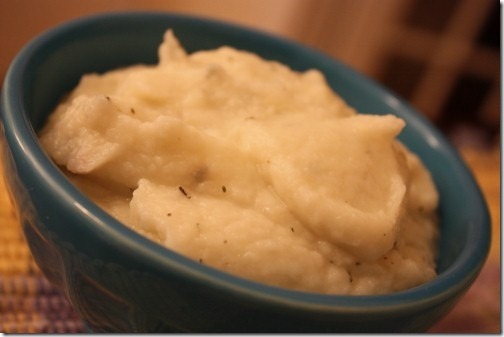 I just made the cauliflower mash, and it’s wonderful!! Thanks for the recipe, Gena!